So after finding out that I may never be able to have kids of my own I realized something (it took me a while to realize this). Something that gave me a WHOLE new perspective on things. Something that made me quit stressing about getting/staying pregnant. I realized that maybe I was put on this earth to let other people know the true benefits of adoption. Maybe I am not able to have more children so that I can more fully experience how wonderful adoption is. Maybe I need to teach other people what it feels like when you love so much you do something for someone else instead of for yourself. I realized that it didn't matter if I would ever carry another child in my womb but that I would forever be a mother. With time I quit counting the days 'til mother nature would come knocking. With time I quit counting the days 'til I was prime to cook. And in that time I was prepared for the trials that would be ahead of me. Positive. I didn't allow my self to get to excited. 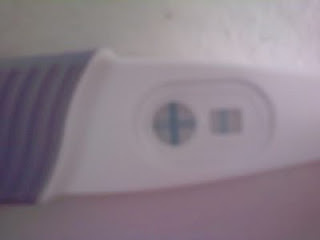 I had experienced 2 other positive pregnancy tests that resulted in miscarriages. I immediately made an appointment with my dr. I didn't know how far along I was because "mother nature" with me hadn't been normal lately. I held my breath the entire ultra sound. Yes I was pregnant but had it implanted correctly. Would it be a viable pregnancy. With my husband in Texas at the time all these feelings were VERY overwhelming! The doctor told me he'd check with another doctor in the office and let me know if everything would be ok. Less than ten minutes later my doctor came back in the room and let me know that while it was still very early everything looked good. The embryo had implanted in a good place and seemed to be viable. But the key in the situation was time and caution. The doctor told me no lifting more than a milk gallon, limit my exercise, and rest as much as possible. Going back 2 weeks later they did another ultra sound. The baby was growing and looking great. I was sick as sick could be, which was a good sign. The doctor kept me on lifting restrictions and told me that if I could make it to 15 weeks I would be able to carry full term. I am 14 weeks now! I can't believe that in a matter of months I could possibly be sitting in a hospital room, this time holding a baby that without a doubt I will be walking out of the hospital with. I can't believe it and yet at the same time I can't wait for it. I do fear however that if I have a girl I will start re-living the moment of placement (since I will be delivering at the same hospital and everything) and have an emotional break down. But I keep my faith, I know that the Lord will make me strong and I carry on. So excited for this miracle! Yay, yay, yay! WWWWWWWWWWWWWWOOOOOOOOOOOOOWWWW GOD IS SOOOOOO GOOD! I am beyond excited for you! We have wanted to try again...but I always feel in the back of my mind that it's not going to happen. Maybe that is why I don't try to hard. Your story gave me hope. I will be praying for you, hoping right along side of you and checking back every day! This is exciting! This delivery will be sooooo sweet!! This is the baby that YOU will take home!! This baby is meant for you! Your experience will be as sweet as the experience you made possible for Lori and Barton. I KNOW they have been and are praying for you to have the desires of your heart because you gave them the desires of theirs. My prayes are with you!! !